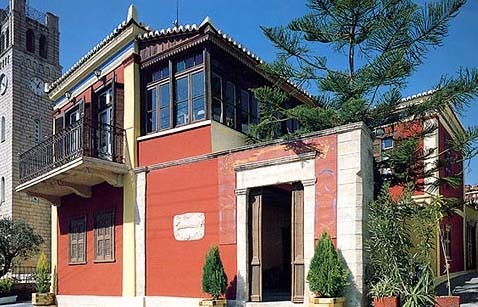 Near the port of Aegina is located a very stylish neoclassical traditional hotel painted in brick red. The building was built in the 1700’s and very much smaller than it is today. 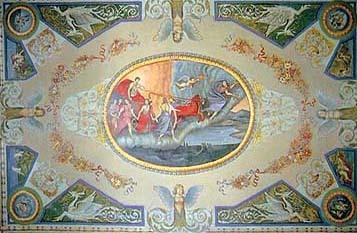 It was renovated and built bigger in the beginning of the 1900’s, and that’s when it acquired its neoclassical style. In general it is a building combined with educated and traditional island factors. The first owners, Ch. Poundoulis and N. Bitros, were people of a very high rank in the political and economical life of the island thus making the neoclassical way the center of Aeginas social life in keeping in people of high society of those times. The ground floor of the traditional building looks into 2 courtyards which are built in such a way that there is always shade decorated with built in stone seats and various old traditional pieces of furniture. The rooms therefore overlooking the courtyards are much more simple giving you the feeling of island’s simplicity rather than the heavy classy rooms on the 1st floor with its high painted ceilings…. 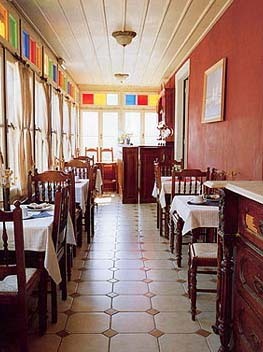 The pension has 12 rooms and one suite made of two double rooms, all of which have private w.c. and shower, central heating for the winter and air-conditioning for the summer and direct dial telephone. It has two courtyards and a roof garden that is open in the summer.. It is open all year round. The island is only 18 miles from the port of Piraeus, 1,15 hours by ferry boat and 35 minutes by hydrofoil. 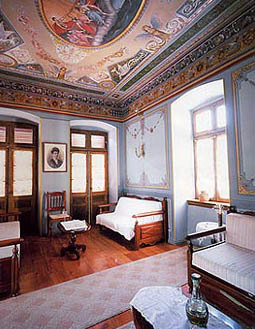 In 1987 the Aeginitiko Archontiko was taken over by Mr. Fotis Voulgarakis who renovated the whole building and converted it into a A’ class traditional pension (Hotel).